Our two-night stay in Al Mukalla gave us a chance to rest and re-fuel. We were the last to arrive and were able to check in with minimal paperwork. Apart from the dinghy landing area being at the main sewage outfall point we liked the place and found everyone as friendly as we'd found elsewhere in Yemen. 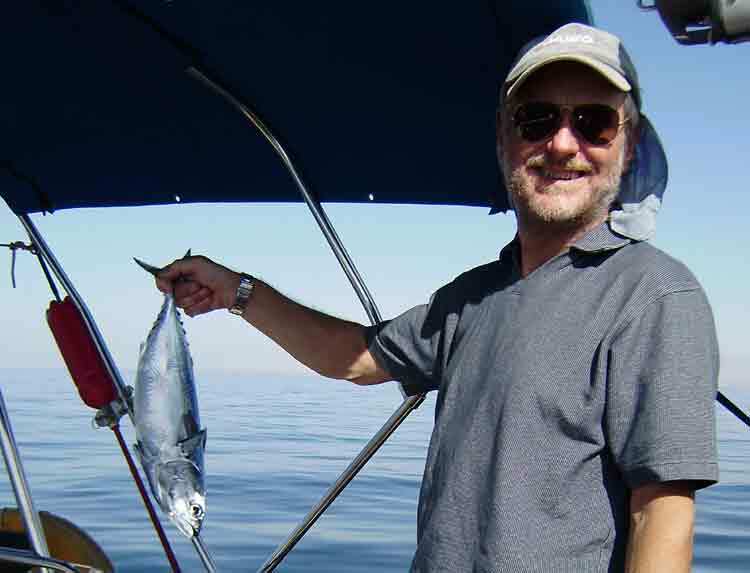 For the last week the weather has been hot and sunny, with little wind, so we had a very boring passage east to Oman. Sometimes the wind would pick up a bit but not enough to sail at a reasonable speed. Again we were constrained by the rally timetable, needing to get to Salalah in time to join in the organisation of our Indian visas. By the time we got there we had covered over 3000 miles on the rally. 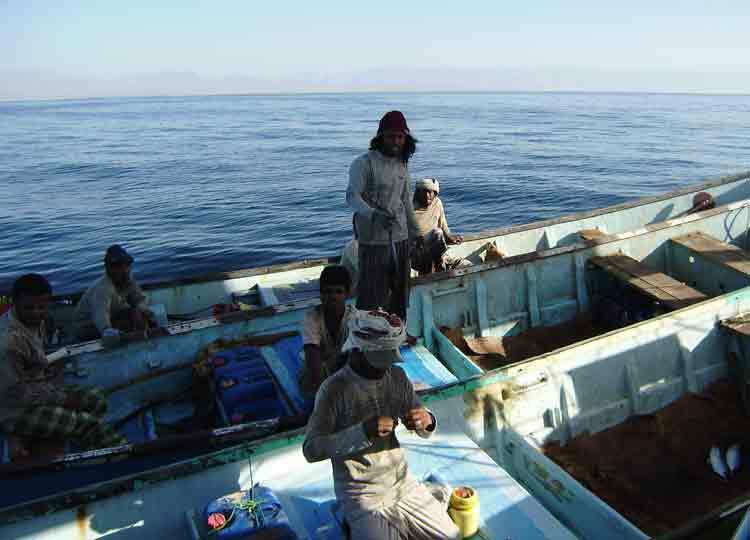 Since being in the Gulf of Aden and now the Arabian Sea, we have been reluctant to run our fresh watermaker. The sea is so full of plankton and sometimes waves of algae, that we have been worried about whether the filters would be swamped. Fortunately we are not short of drinking water as we spent our last Yemeni Riyals on bottled water. At night the phosphorescence from the plankton is spectacular. One night our bow wave was outlined in luminous green. Any disturbance in the water generates light, which can sometimes be startling when keeping watch and worried about missing small shipping boats. One morning the galley slave was woken out of her off-watch slumber by Paul routing around the lockers looking for something to trade with a fishermen in return for a small tunny. Somehow Paul managed to communicate that we never catch any fish so the kind fisherman gave him a lure, line and fishing lessons. Half an hour later we had our first catch (ever). In all the excitement we forgot to check whether it was good eating and only after killing it did we identify it as a frigate mackerel, not the most tasty fish. Nevertheless, we did it justice and ate it. That morning was particularly busy as we were passing through a popular fishing ground and it seemed as if every fishing boat for miles made a detour to ask for water and food. We felt well disposed towards fishermen after our experience earlier in the day and soon ran out of biscuits. With fourteen boats passing through, they must have had rich pickings and we suspected that not all the boats approaching us were on their way back from fishing. One advantage of being at the back of the fleet was that we were forewarned when yachts ahead met problems. Not far from Salalah some came across a field of unlit fishing buoys and floating lines at night. At least two had to untangle lines from their propellers and warned us on the radio so we were able to avoid a similar fate. Salalah has a large commercial port but only limited room for yachts to anchor within reach of the facilities so we are all packed in tightly. As we found in Aden and to some extent Al Mukalla, there are many other yachts here of different nationalities (particularly Australian), mostly heading for the Red Sea. We arrived on Rachel's birthday and had to wait until the evening before managing to clear in and be free to roam. It's a long walk to the port gates but the reward was a visit to the L'Oasis club, run for the expatriates working in the port. It's one of the few places in Oman, other than the international hotels, where alcohol is available, and we were also surprised that the menu includes pork products. We feasted on spare ribs and sausages, washed down by draught Irish beer. We've been back almost every day since, and have introduced some of our European friends to the British tradition of the 'all day breakfast'. Apart from re-stocking and preparing for our long passage to Mumbai, our most important task here is to get our Indian visas. The Indian Embassy is in Muscat, about 700 miles away, so the plan was to send all our passports and application forms by courier. Last night we heard that the Indian Embassy were insisting that we all go to Muscat in person. Today the Dutch ambassador has intervened on our behalf and now only Lo, the rally organiser, has to go. In the meantime the passports have been sent back to Salalah. We expect to be here another week or more while it is sorted out. No wonder so few cruising yachts bother to go to India! 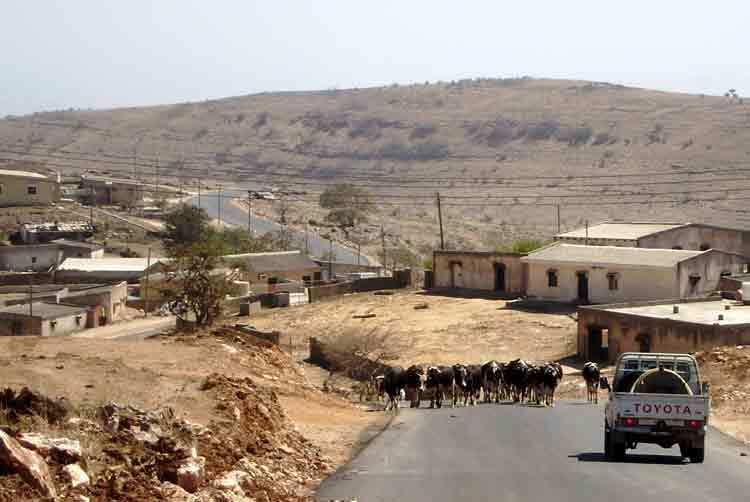 Salalah town is about 7 miles from the port and taxis are expensive so we hire a car when we want to go shopping and exploring. 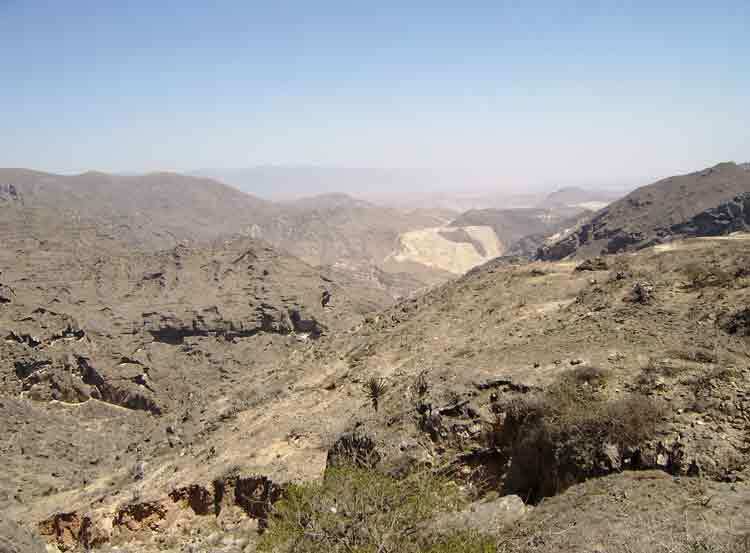 On Sunday we went on an expedition along the coast towards the Yemeni border. There are beautiful beaches and scenic mountains but it is low season now so very few people around. The busy time is in the summer months when it rains and everywhere turns green. 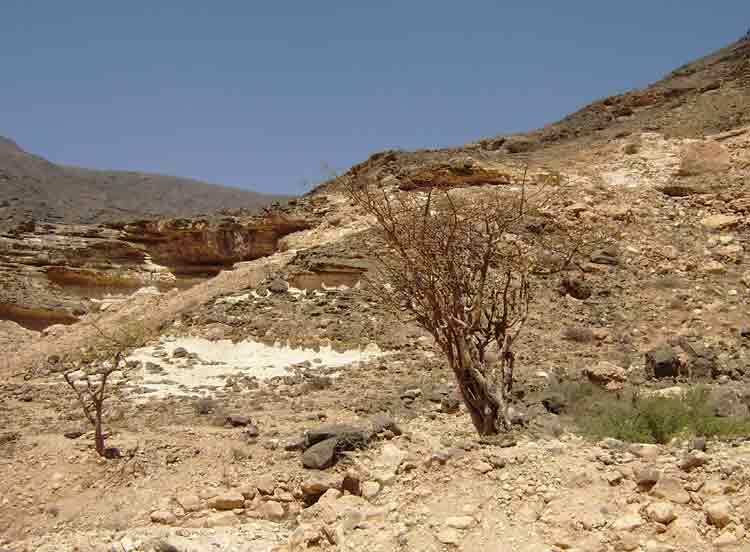 One of the high spots is the area where Frankincense trees grow. They look very unimposing but at one time they were the basis of great wealth for the Omanis (according to Pliny 3000 tonnes per year of the best quality stuff was exported during the first century AD). We also explored north of Salalah where the valleys are a bit more fertile and populated with camels and cows rather than goats.